Binge-friendly. Binge-worthy. Bingeable. The words are used frequently, but what exactly do they mean? After all, this is the age of auto-play streaming, in which someone could easily mainline half a season of Rizzoli And Isles just because the remote is too far away, and “TV binge” is often a euphemism for “gradual surrender to torpor.” So what does it really mean to hold out a show as an example of binge-watch bliss? Maybe it’s easier to figure out what is bingeable by figuring out what isn’t, and somehow Netflix, the streaming service most responsible for our gluttonous viewing habits, has cracked the code with its long-awaited musical drama The Get Down. The Get Down is not bingeable. It defies you to consume more than one installment in a single sitting. If episodes of Orange Is The New Black are like potato chips, episodes of The Get Down are more like Cadbury Creme Eggs—a cloying, excessive assault on the senses best enjoyed no more than once a year. It’s no wonder Netflix—for the first time ever—is splitting the show’s first 12-episode season into two six-episode batches, with the second one debuting sometime next year. Getting through the first six might take that long. As much as those sentiments sound like a full-throated indictment of the show, they aren’t an outright rebuke. There are plenty of things to like about The Get Down, specifically the same things there are to like in the other works of Baz Luhrmann, who created the show with Pulitzer Prize-winning playwright Stephen Adly Guirgis. For one thing, the show looks absolutely phenomenal. The Hollywood trade publications scoffed at the insane price tag for The Get Down, which at a production cost of $10 million per episode makes Game Of Thrones look like a triumph of guerrilla filmmaking. But damn if the show doesn’t look like every dime made it onto the screen. Luhrmann’s reputation for loving and diligent world building continues with The Get Down, which assembles a sprawling patchwork out of the South Bronx nascent hip-hop scene, its burgeoning disco scene, a story about the evolution of a neighborhood, and a culturally specific coming-of-age tale. Everything about The Get Down looks right, down to the clever title reveal, in which the logo appears as a graffiti tag on a passing subway train. The production design is predictably meticulous, and Luhrmann’s penchant for gleeful genre-bending is on full display. The Get Down is rigidly confined to 1977, so the show lacks the intentional anachronisms so common to Luhrmann’s work. But it has every bit of the dazzle and whimsy Luhrmann is known for. But the style and atmosphere are in service of a story with almost no sense of momentum or purpose. Ezekiel “Books” Figuero (Justice Smith) is first introduced as a shadowy figure on a stadium stage, dazzling the crowd with his rap skills before the show flashes back to his adolescence in the South Bronx, a neighborhood at a consequential crossroads. Ezekiel is focused on wooing Mylene (Herizen Guardiola), who secretly longs to become a disco singer despite the wishes of her father Ramon (Giancarlo Esposito), a Pentecostal pastor. Ezekiel’s dedicated teacher tries to encourage his aptitude for poetry, but the only thing that can shift his focus from pursuing Mylene is a dynamic-duo meet-cute with Shaolin Fantastic (Shameik Moore), an aspiring DJ who worships Grandmaster Flash and is inspired by Ezekiel as Ezekiel is by him. The Get Down is every bit the casting masterstroke that Stranger Things was, with actors that seem inseparable from their characters, especially Mamoudou Athie as an aesthetically perfect young Grandmaster Flash. When Books and Shaolin are conspiring to take the hip hop scene by storm, The Get Down feels vital and cool, like the kind of show you’d feign familiarity with to avoid embarrassment at a dinner party. But its narrative sprawl dilutes its impact. There are other important characters, like Jimmy Smits’ Papa Fuerte, a hyper-local populist politico and Pastor Ramon’s brother, and other important storylines including a mystery surrounding the neighborhood’s disco hotspot, Les Infernos. And yet, despite juggling multiple disco balls, The Get Down never feels like anything of consequence is actually happening. The pilot feels like twice its 90-minute run time, and even the standard hour-long episodes are interminable. Part of the problem is The Get Down’s refusal to settle into a groove, an issue owed to Luhrmann’s insistence on pulverizing then blending so many styles and ideas. 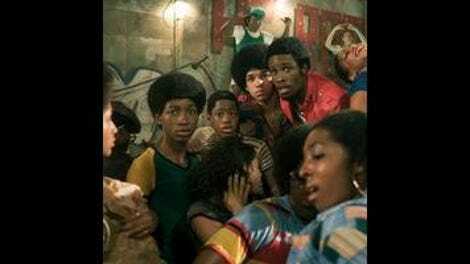 At times, The Get Down is immediate and grounded, and other times its full-blown magical realism, complete with loving homages to classic kung-fu movies and gang squabbles straight out of The Warriors. There’s a certain giddiness to the stylized sequences that makes them appealing even at their most jarring. But once the sugar rush subsides, The Get Down slows to a crawl until its next burst of outsider-art ingenuity. A movie can skate by—and even be great—despite lumbering from one delightful setpiece to the next. That’s not a luxury the television medium offers, and by the end of the super-sized pilot, it’s hard to understand why The Get Down was pitched as a 12-episode saga in the first place. Luhrmann and Guirgis deserve credit for working so hard to get the details right. Nasir “Nas” Jones is an executive producer on The Get Down, and he lends his distinctive voice and lyrical style to the grown-up Ezekiel, even though his expository verses sound slightly stilted. The real Grandmaster Flash serves as a consultant, as does Hip Hop America author and music historian Nelson George, and The Get Down always feels like a labor of love by people who really know and love the music. Then again, the same could be said for HBO’s Vinyl, which also failed to turn its palpable passion for a musical era into compelling drama. The Get Down is Netflix’s attempt to ignite romantic nostalgia for another exciting period in musical history, but it’s all hustle and no flow. Reviews by Dan Caffrey will run every other day starting Friday.